The benefits of rapeseed oil might surprise those who aren’t familiar with this type of vegetable oil. Rapeseed oil comes from the black seeds of the rapeseed plant, Brassica napus, which is the same Brassica family that cabbage, cauliflower, and broccoli come from. The plant’s flowers are bright yellow, and the oil is derived by crushing the seeds. Canola oil and rapeseed oil, though derived from the same plant, are not the same thing and the terms should not be used interchangeably. They both belong to the cabbage/mustard family, but they have a few important genetic distinctions that make them separate oils with unique properties unto themselves. Canola oil was developed by Canadian farmers in the 1970s to remove two undesirable aspects of rapeseed: glucosinolates and erucic acid. The erucic acid found in rapeseed was believed to be too toxic for human consumption, so it was reduced to a much lower level that was considered safe; this became canola oil. Fun fact: the word canola is a combination of the words Canadian and oil. Rapeseed oil is considered a good oil to consume because of its fatty acid balance, and it has the lowest saturated fat of any cooking oil. Rapeseed oil has 120 calories per tablespoon compared to 119 calories in a tablespoon of olive oil (the king of all cooking oils), so though they might be equal as far as calories go, the saturated fat content makes a difference and is something to consider for those trying to lose weight. Contains plant sterols, which are very good at lowering cholesterol. Rapeseed oil can be used for just about every type of cooking, including frying, roasting, and sautéing, and it can also be used to make marinades, dips, and dressings for salads. You can take advantage of rapeseed oil benefits by implementing the oil into everyday cooking or taking it a step further and swapping it out for one of your regularly used oils. According to the Anaphylaxis Campaign group in the United Kingdom, no allergic reactions have been proven to be caused by any refined vegetable oils, and that includes rapeseed oil. Proteins in the oil are what trigger allergic reactions, and the refining process removes these proteins almost completely; only trace amounts are left, if any. A rapeseed oil allergy is therefore highly unlikely, though more research is needed to be certain. Below are some tips to help you use rapeseed oil in your everyday life and cooking. Try different types of rapeseed oils, as their flavors will differ. Much like olive oil, finding one that you like is important, and certain types will be better suited for certain uses, so read the bottle to see which use is recommended. To reduce the saturated fat in your diet, replace your usual oil with rapeseed oil. You can replace butter with rapeseed oil in baking. Keep your oil in a cool, dark place to prevent it from going rancid. Drizzle over pizza or pasta before serving. Use sparingly when drizzling on salads or hummus, because each tablespoon has about 120 calories. Baking with rapeseed oil creates light, fluffy, and delicious baked goods that have a slightly nutty flavor to them. When substituting it for butter, use about 80% of the amount of butter called for and then top up the other 20% with some kind of liquid, like milk or buttermilk. In many recipes, the act of substituting ingredients is often a trial-and-error process, so keep track of what you did; if it didn’t work, tweak for the next time until it comes out just right. Below is a delicious brownie recipe that uses rapeseed oil. 1. Preheat the oven to 350 degrees Fahrenheit. Line a nine-inch square tin. 2. Whisk the eggs and sugar together until pale and creamy. Sieve the flour and cocoa together and whisk into the egg mixture; then whisk in the oil. 3. Pour into the prepared cake pan; scatter the cranberries and chocolate chips on top. 4. Bake for 25 to 30 minutes. Cool slightly before removing from the cake pan. Cut into 12 pieces. “What Is Rapeseed Oil?” Rapeseed Oil Benefits web site; http://www.rapeseedoilbenefits.com/guide-to-rapeseed-oil/what-is-rapeseed-oil.aspx, last accessed March 31, 2016. 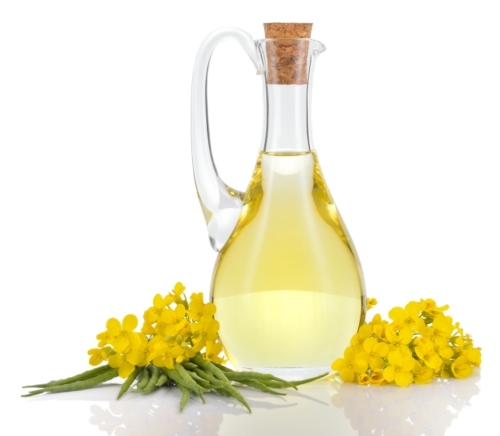 “Nutrients Found in Rapeseed Oil,” Rapeseed Oil Benefits web site; http://www.rapeseedoilbenefits.com/guide-to-rapeseed-oil/rapeseed-oil-nutrients.aspx, last accessed March 31, 2016. “Shopping for Rapeseed Oil,” Rapeseed Oil Benefits web site; http://rapeseedoilbenefits.hgca.com/guide-to-rapeseed-oil/shopping-for-rapeseed-oil.aspx, last accessed March 31, 2016. “What’s the Difference between Canola and Rapeseed?” The Kitchn web site; http://www.thekitchn.com/whats-the-difference-between-canola-and-rapeseed-206047, last accessed March 31, 2016. “Health Benefits of Rapeseed Oil,” Wharfe Valley Farms web site; http://wharfevalleyfarms.co.uk/why-rapeseed-oil/, last accessed March 31, 2016. “Rapeseed Oil,” Fat Secret web site; https://www.fatsecret.com/calories-nutrition/generic/rapeseed-oil, last accessed March 31, 2016. “Olive Oil,” Fat Secret web site; http://www.fatsecret.com/calories-nutrition/usda/olive-oil?portionid=56943&portionamount=100.000, last accessed March 31, 2016. “Is Rapeseed Oil Healthy?” Livestrong web site; http://www.livestrong.com/article/458165-is-rapeseed-oil-healthy, last accessed March 31, 2016.